Instead of heading out this morning with my running buddies, I was at the dentist having a broken filling repaired. I like to get out as early as possible on my weekend runs, so I can cover longer distances and still have my day. If I scheduled the dentist any later in the morning, the inevitable backups would have taken too much time. That's why I'd asked for the first appointment of the day. It's been years since I've needed to get a local anesthetic at the dentist, so that was lots of fun (not). My dentist talked to me about Cow Harbor. She lives in Northport and has run the race a couple of times. I told her I'd run it this year if she does. I'm pretty sure I will participate either way, so I can run it with SIOR and TPP. I'm still on the fence about Dirty Sock though. Since I have so few opportunities to run these days, I knew I had to get out today. The weather was ideal, mostly overcast, with temperatures in the low 70's. One side of my mouth was still unpleasantly numb when I set off from my driveway. Almost immediately after starting, I was flagged down by a man on a bicycle who asked me a question about the neighborhood. I stopped my Garmin while I chatted with him, and thought I'd restarted it once I resumed running. 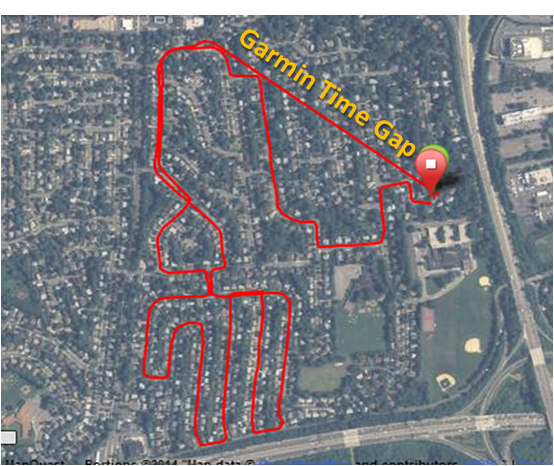 I had covered about 1.5 miles when it occurred to me that I hadn't heard the one-mile chirp from the Garmin. I looked at my watch and realized that it wasn't recording time or distance. I restarted the timer, figuring I could determine my mileage when I got home by mapping my route with Milemeter. Since I had started off with the Garmin recording my start time, I was able to back into my pace by subtracting the "chat" time from total run duration. Surprisingly enough, my mouth was still a little numb by the time I got home and that prevented me from having my usual post-run refueling. I did drink about 24 ounces of water to re-hydrate. Within an hour, the numbness had thankfully worn off. Between the dentist and the run, I was fairly wiped out, so that came at a perfect time for lunch. I was glad to get in some decent mileage today. I'm not sure what I'll do tomorrow, because the family has early morning plans. Maybe a 6:00 AM run is in order. That might help prepare me for even earlier workouts on weekdays.